If you told me earlier this summer that I would “accidentally” bike 18 miles one afternoon, I’d have laughed. I’ve always loved biking, but rarely have time for long distance rides. As part of the mobile workshops for an Extension professional development meeting in Burlington, Vermont, fifteen of us met up with the coordinator of Local Motion, a grassroots bike advocacy organization. Their mission is “to bring the joy of walking and biking within reach for all Vermonters by helping Vermont communities become great places to walk and bike.” The purpose of the tour was to get an on-the-ground lesson in community development and learn how the group has worked with residents to overcome challenges in implementing a successful project. Burlington’s “Island Line Trail” is a classic rails-to-trails project–not unlike the Blackwater Heritage Trail in Santa Rosa County–that has resulted in significant economic development and increased use by area residents. The original rail service operated from 1899 to the early 1960’s. Since the 1990’s, 14 miles of railway has been converted to a biking/walking trail. Part of the Island Line’s charm is the diversity of scenery it encompasses. 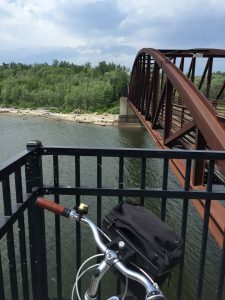 Starting in the heart of downtown Burlington, there are museums, shops, and restaurants within blocks of the trail, many of which cater directly to and exist because of the trail users. 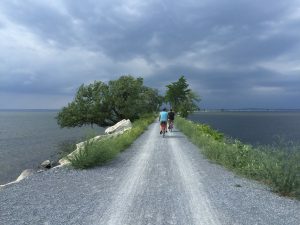 The entire stretch runs adjacent to Lake Champlain, providing scenic views along the path. Throughout the trail there are residential areas (which are highly desired because of their proximity to the trail), public parks, and a community center. 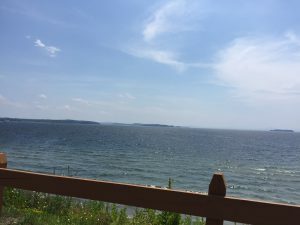 After crossing a bridge over the Winooski River, we embarked upon a 3-mile open causeway with sweeping views of Malletts Bay on both sides. The trail also includes one of the country’s few bike ferries, which is located where a swing bridge used to operate for the railway. It was the constantly changing scenery and surroundings that kept a handful of us going far beyond the initially planned 6-mile trip. In addition to providing a recreational trail for local residents and visitors, Local Motion is dedicated to promoting bicycle safety and education. Workshops for hesitant adult bikers interested in biking more attracted over 450 adults last year, while 7,300+ kids participated in bicycle safety camps and training. As a result of all of the activity, youth bike rentals increased by 43% in 2015 over the prior year. Much of the success in Burlington is transferable to Florida. In the Panhandle, we are looking at connecting existing trails to create a large-scale multi-county, multi-state bicycle trail. The successes in Vermont were inspirational and instructional as we embark upon our new project and a design workshop in late September.